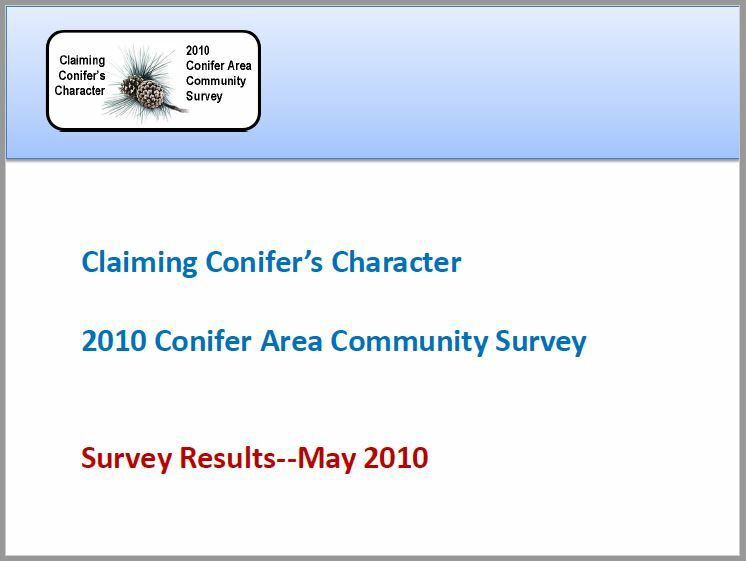 We’re pleased to share the results of our 2010 Claiming Conifer’s Character Community Survey. This year we had 1,329 residents share their perspectives, an increase of 1/3 from the 2006 survey. The survey was offered between February and March of this year. We provided both paper copy as well as an Internet-based option. We were pleased that ¾ of respondents used the Internet version. By using an Internet survey provider, we were able to manage and analyze the information more efficiently. Many individuals and organizations provided input as we developed the survey and we thank all of those who assisted. Their recommendations helped us craft a targeted set of questions that serve us well as we consider and plan for a Conifer future we can all embrace. We’re interested in making these findings as useful and available as possible. If you’d like a presentation for your organization, we’d be pleased to provide that. Feel free to download and utilize these findings. We merely request that you provide attribution to Conifer Area Council.